We've been a bit light on gaming this week as a result but hopefully will be back to normal after some much needed rest this weekend. Ticket To Ride Europe: I met up with my sister one last time before she returns to her home on the other side of the world - and of course she wanted to play 'trains'. Our last match for who knows how long ended up as a draw between me and her. Exploding Kittens: Newest purchase so we tried a few rounds. Initial thoughts are OK, there's fun to be had but I'm not blown away. Might be more fun with 5 players but the few games we had the strategy seemed to be to collect cards and keep pushing the exploding kittens to the end, and then it was whoever had the most skips, attacks and nopes who seemed to win. Exploding Kittens - Being one of the most successful kickstarter games ever has drawn a fair bit of intrigue from many gamers - including myself. So after a fair bit of curiosity (that killed the cat), I finally added Exploding Kittens into my library of games, getting the standard version. Some light humor and nice artwork. 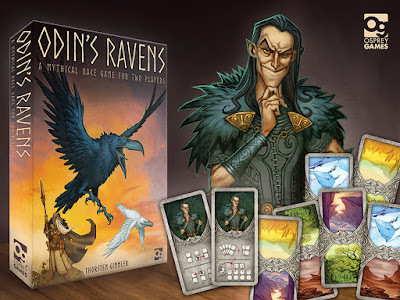 Will do a review eventually when I've played it enough..
Odin's Ravens - A two player race to see which raven can fly around the world the fastest in yet another two player game for the collection! This game has a bit of history originally being a funded kickstarter campaign that somehow never got finished. Osprey Games - even though they had nothing to do with the original kickstarter, stepped in and not only produced the game but sent a free copy to everyone who funded the original kickstarter campaign. Knowing that was enough to warrant me spending my hard earned cash to support Osprey, and I'm secretly hoping it to be a good one but yet to try it!